From 2002 to 2013, Consumer’s Union found 578 recalls from six major manufacturers: Biomet, DePuy, Smith & Nephew, Stryker, Wright and Zimmer. Stryker had the most recalls with 231 and DePuy came in second with 150. These recalls came too late for tens of thousands of people who already received the problematic devices. Several joint manufacturers have recalled metal-on-metal hip implants during the past decade. The companies promised their metal-on-metal designs would increase mobility. But certain types of hip replacements may be more prone to failure and recall. The recalls often come too late for tens of thousands of people who have already received these problematic devices. The U.S. Food and Drug Administration only recalled three products between 1993 and 2003, according to a 2013 analysis by Consumer’s Union. Most recalls are done voluntarily by companies because it is expensive for the FDA to recall products. 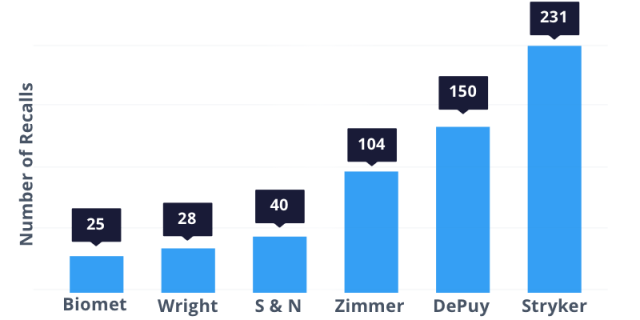 According to Consumer’s Union, these six companies made the most hip recalls between November 1, 2002, and July 23, 2013: Biomet (25), Wright (28), Smith & Nephew (40), Zimmer (104), DePuy (150) and Stryker (231). The hips were recalled for several reasons. All six companies recalled products for labeling issues. Five companies initiated recalls because of manufacturing issues, and four companies had recalls for packaging issues. Faulty hip implants have led to thousands of hip replacement lawsuits. People harmed by the devices allege that the companies who recalled the products knew about their faulty designs or failed to warn patients of the risks of the implant. When companies settle these lawsuits, they usually only settle cases with people who received the device before it was recalled. Companies commonly provide compensation for some medical bills and other damages when they recall products, but participating in a company’s recall program can limit a person’s eligibility for legal claims against a company. The FDA cleared many problematic hip replacements through a process known as the 510(k) program. The 510(k) program allows manufacturers to sell their devices as long as they can show that a “substantially equivalent” device is already on the market. Sometimes, approved hip products are based on products that were later removed or recalled from the hip implant market. 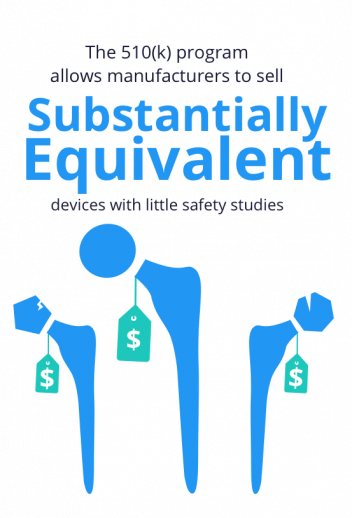 Because the 510(k) doesn’t require rigorous safety studies and trials, it increases the chance that patients may receive faulty or ineffective devices. Since a large number of recalls involved metal-on-metal hips, the FDA called a panel meeting in June 2012 to discuss issues related to these devices. The hearing was open to the public. A number of surgeons and researchers provided data on metal-on-metal hips. Dr. William Rohr of Mendocino Coast District Hospital, the panel chair, said he saw no reason to continue using metal-on-metal implants, but the FDA did not recall the devices. Instead, panel members requested more studies. The panel also agreed that doctors should inform patients of the problems associated with these devices. Device recalls may be initiated by the FDA or the manufacturer, but the FDA rarely initiates recalls. Device manufacturers know they have a legal obligation to properly design, manufacture and test their products. They also have to warn the public if a device fails, has adverse side effects or doesn’t do what it claims. That’s why some manufacturers decide to voluntarily recall defective devices. The FDA relies on manufacturers to monitor the safety of their devices and to report any problems after a device hits the market. Critics complain that this type of lax regulation gives manufacturers little incentive to make safety a priority. Studies by independent medical researchers sometimes bring attention to device failures that manufacturers either miss or ignore. Fortunately, consumers and health care professionals are also able to report any problems directly to the FDA. The Durom Cup was temporarily recalled by Zimmer in July 2008. The company began marketing the acetabular component in 2006, and more than 12,000 Americans received the implant. Zimmer recalled the Durom Cup after receiving large numbers of reports of device failure. The company claimed the failure was caused by surgeons who didn’t know how to properly implant the device. However, the FDA claimed the recall was caused by false and misleading labeling. Zimmer released new surgical instructions and continued to sell the product until 2010, when the Durom Cup was permanently discontinued. DePuy’s 2010 recall involved the company’s Articular Surface Replacement (ASR) Acetabular Hip System and ASR Hip Resurfacing System. The latter was sold only abroad. Depuy voluntarily recalled its hip systems after unpublished data from the U.K. joint registry revealed that metal devices had more problems than older devices and they were less durable. In September 2011, the National Joint Registry of England and Wales published a report that DePuy’s ASR acetabular implant was replaced or removed 29 percent of the time after just six years. This was compared with an overall 9.5 percent failure rate for all-metal hip implants. In January 2013, the jury in the first ASR trial heard evidence that at the time of the recall DePuy knew that within five years 40 percent of its ASR implants would fail. Approximately three years after the Rejuvenate and ABG II hip systems were first approved by the FDA, Stryker issued a voluntary recall of the devices in July 2012. The recall came after Stryker received post-market data that revealed the metal modular necks and stems of these two devices were prone to corrosion and fretting that could release excessive metal debris into body, damaging surrounding bone and tissue. Just two months before the recall, Stryker issued an urgent field safety notice that warned doctors and hospitals that the two implants had an increased rate of adverse local tissue reactions. The reactions were caused by inflammation in the tissue surrounding the implant because when the components rubbed together, metal debris was released causing metallosis. Smith & Nephew launched its R3 Acetabular System in Europe and Australia in 2007. The devices were released in the United States in 2009. In June 2012, the company issued an international recall of the R3 system’s metal liner because of complications such as implant failure, loosening, pain, dislocation and metal sensitivity. The metal liner was marketed as durable and wear-resistant. However, Smith & Nephew said the metal liner had not performed as well as the company had expected. Between 3,000 and 4,000 Americans received the metal liner option before it was recalled. UK-based Smith & Nephew launched its Modular SMF Hip System in 2008 and its Modular Redapt Femoral System in 2012. On November 15, 2016, the company recalled both hip implant systems because of large numbers of adverse events and complaints. It sent out an urgent field safety notice warning doctors to monitor patients for high levels of metal ions in the blood. Metal debris can cause adverse tissue reactions that may require revision surgery. The affected devices shipped between October 2008 and July 2016.